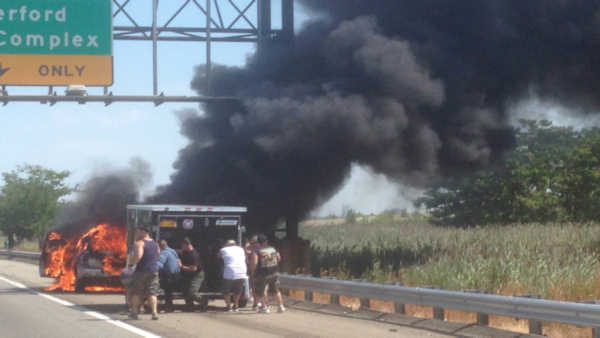 EAST RUTHERFORD (WABC) -- There was trouble on the New Jersey Turnpike when an SUV burst into flames on Saturday afternoon. The fire happened near Exit 16W in East Rutherford. Police say the Chevy Trailblazer with four people inside was heading to MetLife Stadium when the driver noticed a fire burning in the back, and pulled over. Everyone got out safely. The driver detached a trailer the vehicle was pulling, so it wouldn't be damaged. The car, however was destroyed. Three lanes of the turnpike were shut down for an hour.